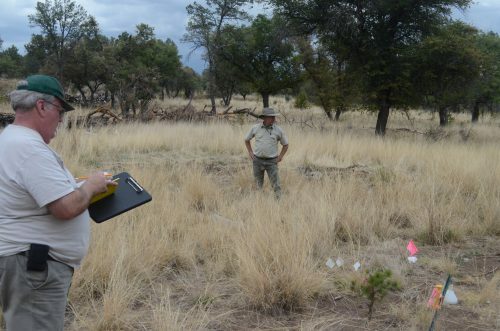 Jim Houser (left) and Michael Merritt (right) of the Texas A&M Forest Service surveying a portion of the Davis Mountains preserve, where they have been working to restore the Ponderosa Pine population. In the Davis Mountains of far West Texas you will come across vegetation and animals you’d be hard pressed to find anywhere else in the state. Take for instance – The Rocky Mountain Ponderosa Pine – a soaring tree that’s only found in two other areas in Texas. 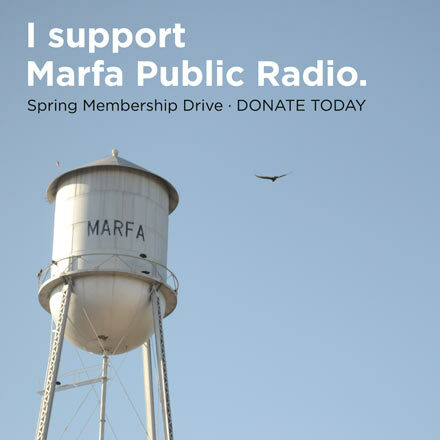 But in the Davis Mountains over the last decade up to 75 percent of the trees’ population has been lost. Now, scientists and foresters are attempting to save the Ponderosa Pine. 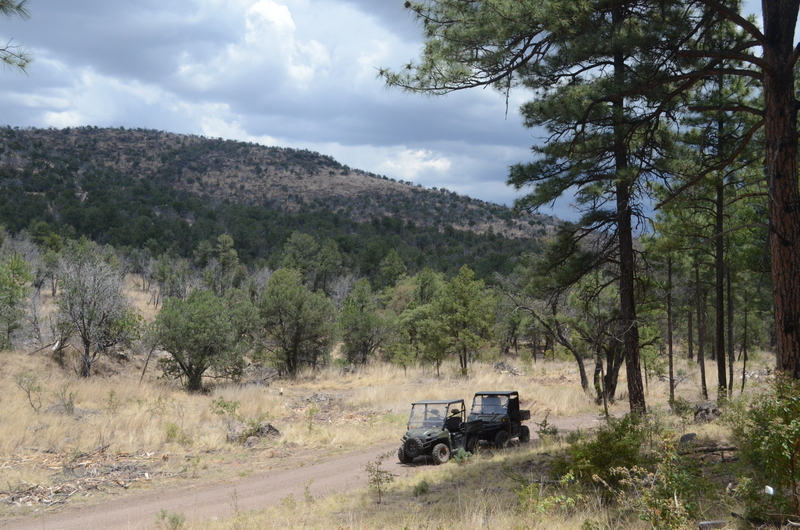 On Nature Conservancy’s Davis Mountains Preserve, foresters Jim Houser and Michael Merritt are starting up their utility vehicles and checking their gear. Today, they’re surveying the preserve’s Ponderosa Pines. Nature writer Arthur Plotnik once called the Ponderosa a “Clint Eastwood of a tree.” And even foresters tend to wax poetic when talking about it. “A mature ponderosa kind of reminds me of an elder statesman,” Merritt says. “You know somebody that people look up to and has confidence. On this overcast day, as clouds are rumbling through the Davis Mountains, Merritt and Houser are driving out to a 500-acre stretch of land on the preserve, where for the past several years, the Texas A&M Forest Service and the Nature Conservancy have worked together to restore the area’s Ponderosa population. “They have been through a lot,” Merritt says of the tree. But “a lot” might be a bit of an understatement. First, came the drought. That, plus years of extreme temperatures, weakened the trees. Next, came an outbreak of pine bark beetles, tiny bugs that attack and eat away at vulnerable trees. Then in 2011, a massive the Rockhouse wildfire roared through the Davis Mountains. These three factors have contributed to the Ponderosa’s loss in far West Texas, says Charlotte Reemts, a research ecologist with the Nature Conservancy. The Nature Conservancy and the Texas A&M Forest Service call this project Operation Ponderosa. Step one of the project was to thin out some wooded areas. That meant cutting down other trees that were competing with Ponderosas for water. It may seem counter intuitive, but Reemts says thinning is beneficial for trees. “Our hope is that by reducing the number of trees to something more what was like there 100, or 200 years ago, the trees will once again be able to survive droughts, survive beetle outbreaks,” Reemts says. Step two: Introduce new Ponderosas. Starting in late 2015, researchers like A&M’s Jim Houser planted more than 2,000 seedlings in areas where the stressed pines had stopped pollinating. But foresters ran into an unexpected problem: Gophers snacking on the baby trees. Back at the preserve, Houser is walking the grounds where herbivores, mainly gophers, have been eating the transplanted Ponderosa seedlings. In the Davis Mountains preserve, foresters estimate that over the last decade up to 75 percent of the Pondera Pine population has been lost. For the last several years, they’ve visited this site, working to re-establish the tree’s numbers. Clipboard in hand, Houser points out an area where they have been running gopher-deterring experiments In the brush, white flags mark where seedlings have been planted, but lately they’re more like grave markers. Houser, however, believes the group will come up with a solution that will prevent the loss of ponderosa seedlings. They’re also experimenting with other physical barriers in the soil, and using taste and smell deterrents, plus some balsam fir oil, hoping one method will put off eager gophers. Near one of the experiment markers, Merrit spots a white flag, but has to sift through the dirt a while before he finds the seedling. He calls out to Houser, who marks the number of seedlings that have either died naturally or were eaten. “Number 2 is dead,” Merritt says, as Houser sighs deeply. So far, the experiment results haven’t been too promising. Either the seedlings are dying, or gophers and other animals are getting to them. “My kingdom for a live seedling,” Houser says as the two survey the experiment plots. With the unfortunate results, I ask Houser if it’s back to the drawing board. “It’s always back to the drawing board in science,” Houser. “But at least this time we have a little on the drawing board,” Merritt chimes in. “Exactly, we can pin one up,” Houser finishes. The team says not all hope is lost. In other parts of the preserve, where the ground is rocky and gophers aren’t a problem – natural Ponderosa seedlings are taking hold. Houser says it’s now just a matter of time before they grow and begin pollinating. And come December, the forest service crew will return to the preserve to plant another 2,000 seedlings in hopes of one day reestablishing the majestic Ponderosa Pine in the Davis Mountains Preserve. This entry was posted in KRTS News, KXWT News and tagged Nature Conservancy, Ponderosa Pine, restoration, Texas A&M Forest Service, West Texas. Bookmark the permalink.